An ancient land, once thought to be lost, has been found in the East Sea. It is said that the land was filled with exotic treasures, and has the legendary fountain of youth which can grant eternal life. Countless people have already set off on their adventure seeking the vast treasures. What are you waiting for? Sail to this new world, explore the mystical land, and claim your treasures! 1. 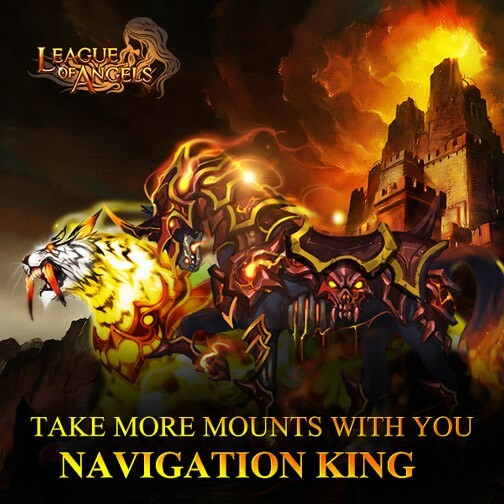 The Navigation King event lasts only THREE DAYS now, don't miss out the chance to gain more resources for the coming Tycoon! 2. Dragon Clarion(the exclusive amulet for Nereida and her evolutions) and new Amulets(Dark Grail, Dudaemon Ring and Spirit Melody) are available in Emporium! 3. Hellish Wolf, Silver Queen, Nereida, Blazing Hecate, Valentina, Fallen Angel, Phoenix, Tusky, Persian Cat, St. Patrick's Attire, Cowboy Fashion, Golden Attire will also be there. 4. More Runestone, Enchanted Ore, Spirit Essence, Gem Enhancement Stone, Blessed Stone, Awakening Stone, Angel Tears, Aegis Shards and Purgatory Soul are added in Emporium! Don't miss them out! 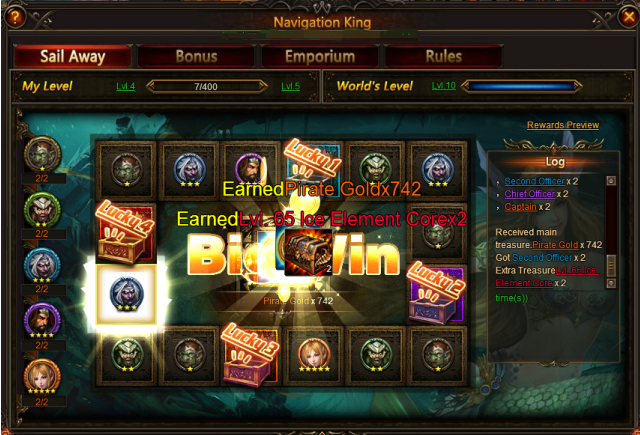 Click the icon of Navigation king you will see four options: Sail Away, Bonus, Emporium, and Rules. 1. Player can board a ship once and employ 1 mariner for free each day. 2. Voyage will begin after the countdown finishes. 3. Spend 50 diamonds to employ one mariner immediately. The mariner can find bonus treasure for the player. Different mariners can search for different treasures. The cost is the same, but the chance to win extra treasure differs. Choose wisely! 4. 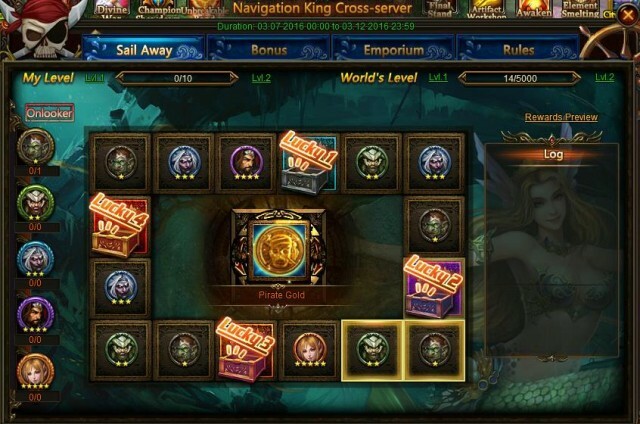 A Cross-server mariner treasure hunt will also take place during the voyage. 5. Paying any amount of the boarding fee also gives pirate gold. When voyage finishes, you will see the treasure interface. You can get pirate gold and have chance to get extra treasures. If the mariner who finds treasure is one of the mariners selected by the player, then they will also win extra treasure at the end. For example: You choose 1 and 3 star mariner at first. 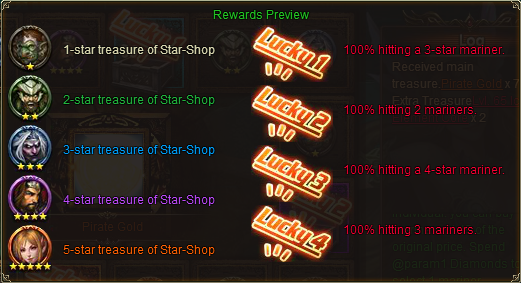 If the wheel stops at 1 star mariner, then you will get the corresponding reward. And if you chose 4 1-star mariner, then you can get reward x4. The higher your Individual level, the more Pirate Gold you will get. If it stops at this icon, it means it will 100% hit more than one mariner. 1. 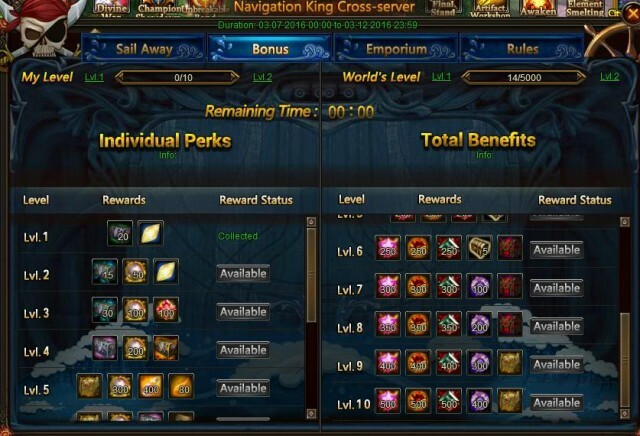 There are Individual Perks and Total Benefits( server benefits) in this part. Items in the screenshot may differ from actual in game. 2. Employing 1 mariner increases individual/world navigation EXP by 1 point. 3. Player can get rewards when they reach the corresponding level. 4. There will be some bonus events when the corresponding level is reached. Please note the screenshot above is not the updated version. Please check in game for the final updates. Including, Khaos Core, Nocturna Awakening Stone, Darkspirit Ram, Rudolph, Purgatory Soul, Dark Soulstone, Spring of Wisdom, Grotto Heart and more! Note: Some items are D-limited and some are Event-limited. Daily Limit: you can only buy the items for certain times each day. Event Limit: you can only buy certain items for certain times during the event. Please note that the information above is not final and may be adjusted. Final updates will be determined in game. More exciting events are coming up through May 5 to May 12 (Server Time), check them out in the in-game Hot Events menu now! 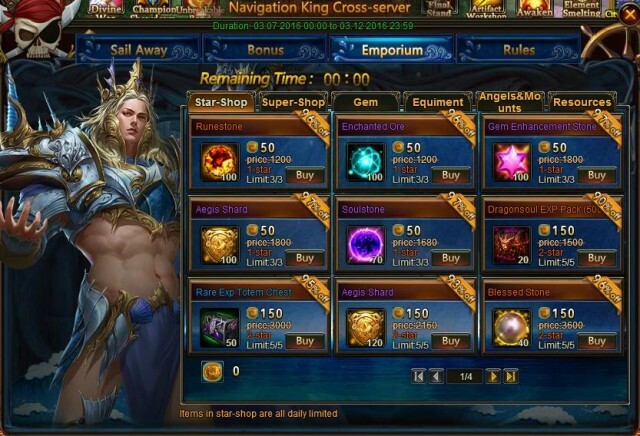 LoA_The 15th Cross-Server Team Tournament Coming on May 16th!